You sell a lot of tomatoes. How do you can them when so much is going on in the middle of the season? I will leave to Extension the details of the canning process but I will be glad to share a few ideas that help us save some time in preserving the tomato harvest. From a big picture perspective, canning kills potential pathogens with heat and then seals out oxygen and spores so the food does not spoil or make the consumers ill when containers are opened later. Botulism is a particularly bad actor because the spores of those bacteria resist heat treatment and they grow happily in the low oxygen environment of canned food. So please follow canning directions, especially when they call for adding acids like vinegar or lemon juice. That addition helps make certain that the food in the canning jar is inhospitable to botulism growth. Heat resistant spores are not the problem as much as the nerve toxins that botulism bacteria produce as they grow in the jar. If all this talk of nasty critters is about to discourage you from even considering canning tomatoes, remember that of all the tomatoes that are canned each year, roughly ten cases of poisoning are reported to the CDC. So – most of us are apparently following canning directions. Another bright spot is that heating to boiling for ten minutes (as is often the case in using canned goods), will inactivate any toxin that happens to be present according to the CDC. 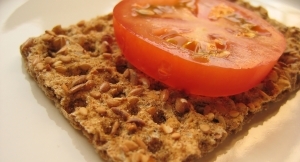 Eat many, many fresh tomatoes while they are in season – eggs on a bed of tomatoes for breakfast, cheddar and tomato sandwich for lunch, and a Greek salad for dinner. Enjoy them fresh while they last. Extend your fresh tomato season on both ends with row cover and hoop houses. 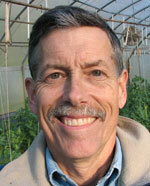 Late blight resistant variety offer more hope for tomato season extension in WNC. Fresh tomatoes for half the year are a realistic goal in my experience. With a heated greenhouse, nearly year-round production is possible but those may be expensive tomatoes unless you grow many plants. 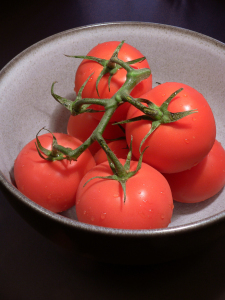 Consider freezing tomatoes. Just remove the stem scar and core, blanch, and put in a freezer bag. If you are short on freezer space, considering running them through a food processor first. Don’t forget to mark the bag with contents and date. Go to the paint store and get a paint strainer. I cannot recall who gave us this idea but it is our best time saver in canning tomatoes. Our paint strainer fits over a five gallon bucket but we normally use a kitchen kettle. First we core the tomatoes and turn them to tomato mash in a food processor. I include skins and seeds but some prefer to remove them. Each food processor batch goes into the paint strainer in a large container. When we have enough to start canning, we drain tomato juice through the paint strainer or squeeze it a little. We can the pulp as tomato sauce and the juice for soup stock or beverages. The strainer avoids “cooking down” tomato sauce so it comes out brighter red and it seems to retain more of the fresh tomato flavor, even after canning. If we want a more simmered tomato taste, we do that when we open the cans in winter. Finally – plan ahead. We hate to disappoint customers at market but after weeks of taking home tomato seconds from market, we now have a line of customers and dwindling supplies. Mid-August to mid-September is prime time in most years to get very ripe and flavorful tomatoes at a good price. Consider supplementing your home garden production with a variety of flavorful tomatoes at your neighborhood tailgate market.